In the following example is described how you can extend the Itinerary Designer to create an Orchestration Extender which contains a Policy and a DocumentType property. These properties are used in a Validation Orchestration Service which validates the message by using the Business Rule Engine. 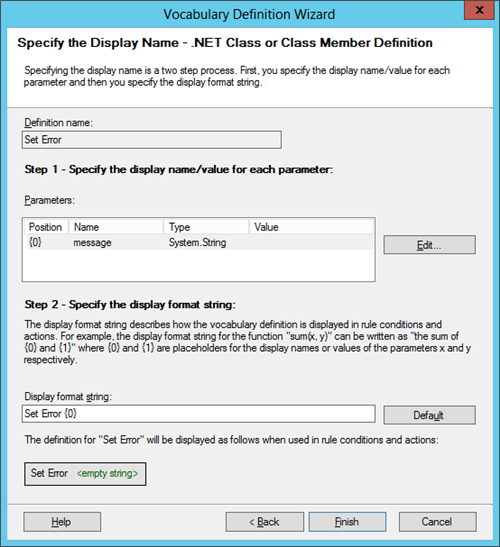 Create .NET Helper Classes that are used in the Validation Service and in the Policy. Create a Custom Extender for an Orchestration-Based Itinerary Service. Create an Orchestration-Based Itinerary Service to validate the message. Create a Business Rule Policy for validation. Create an Itinerary with the Validating Service. Figure 1. Microsoft Visual Studio 2012 SDK installation wizard. Figure 2. Microsoft Visual Studio 2012 Visualization & Modeling SDK installation wizard. Custom .NET Classes are used in the Validation Service to read the PropertyBag and in the Business Rule Policy to set the error. 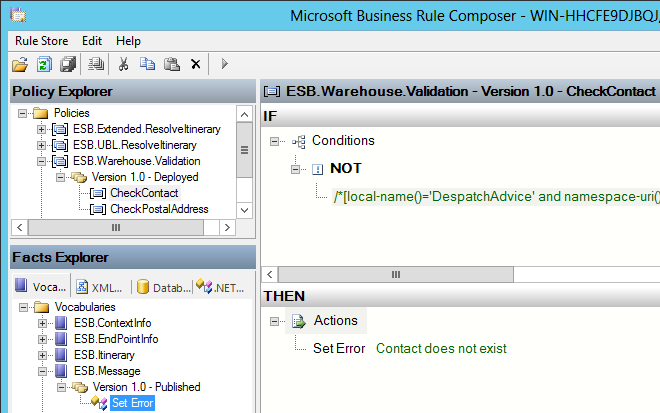 Create a .NET Class to set the error in the Business Rule Policy if the validation fails. Create a .NET Class to read the properties from the PropertyBag. 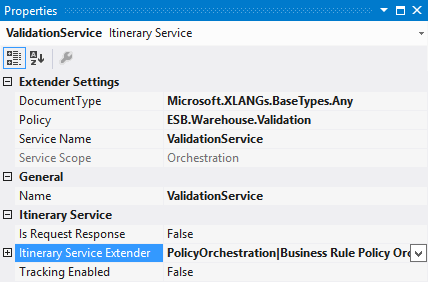 Create an Extension Provider class that derives from the ExtensionProviderBase class and have the ExtensionProviderAttribute applied to it with properties that identify the extension and its purpose. These values will be displayed to the user in the Itinerary Designer when the user is setting the Extender property on a model element. Figure 3. 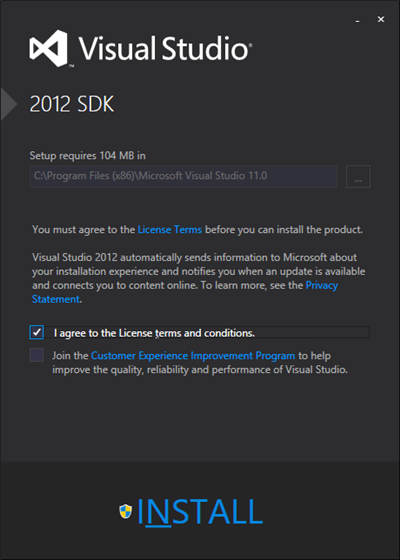 Extension Provider class in Visual Studio. 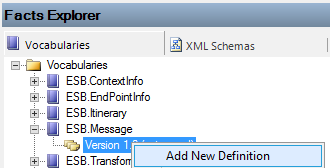 In the Extender class, the following attributes are applied to the properties: attributes necessary for proper display in a property grid, attributes included in the Microsoft Enterprise Library for validation purposes, attributes necessary for proper serialization, and/or attributes that determine how properties are persisted. Figure 4. Microsoft.Practices.Services.Itinerary.DslPackage\Lib folder in Windows Explorer. The Orchestration Extender properties are used in a Validation Orchestration Service which validates the message by using the Business Rule Engine. In the Orchestration use a custom .NET Class to read the values from the PropertyBag. Figure 5. Custom .NET Class in Expression Shape to read the values from the PropertyBag. Execute the Business Rule Policy. Test if the message is valid. Throw an Exception if validation fails. Figure 6. Orchestration-Based Itinerary Service. Open the esb.config file located in C:\Program Files (x86)\Microsoft BizTalk ESB Toolkit. 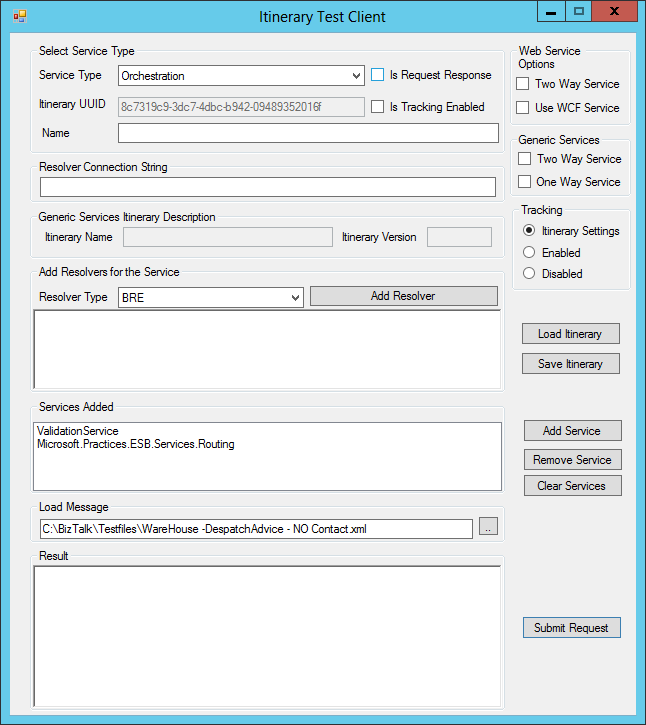 Add the custom Orchestration Service in the itineraryServices section. The Validation Orchestration uses the Business Rule Engine to validate the message. With a custom .NET class is the error set. The following steps describe how to add a custom .NET Class to the Business Rule Composer and how to create a Business Rule Policy to validate the message. Add a New Vocabulary in the Facts Explorer to use a custom class in the BRE. Figure 7. Add a New Vocabulary in the Facts Explorer. Add a New Definition to the Vocabulary. Figure 8. Add a New Definition in the Facts Explorer. Add a .NET Class to the Vocabulary Definition. Figure 9. Add a .NET Class in Vocabulary Definition Wizard. 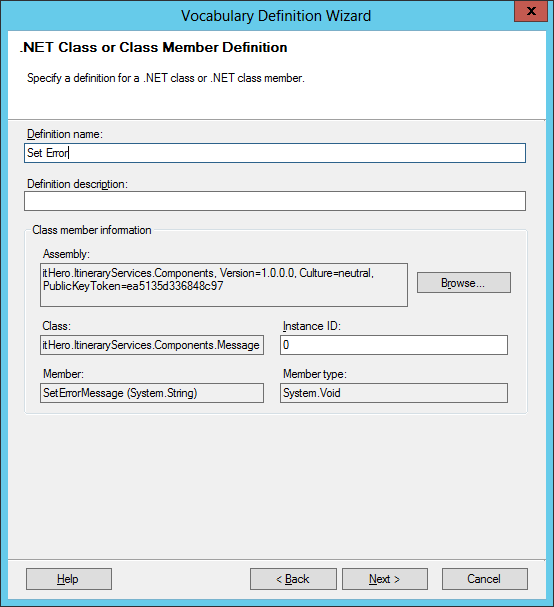 Set the Definition name and select the .NET Class. Figure 10. 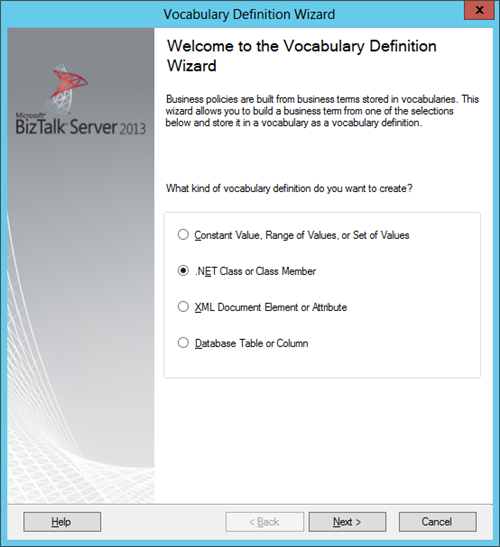 Specify a definition for a .NET Class in Vocabulary Definition Wizard. Figure 11. Specify the Display Name in Vocabulary Definition Wizard. Create a Business Rule Policy to validate the message. Use the custom class to set the error if the validation fails. Figure 12. Business Rule Policy in Business Rule Composer. 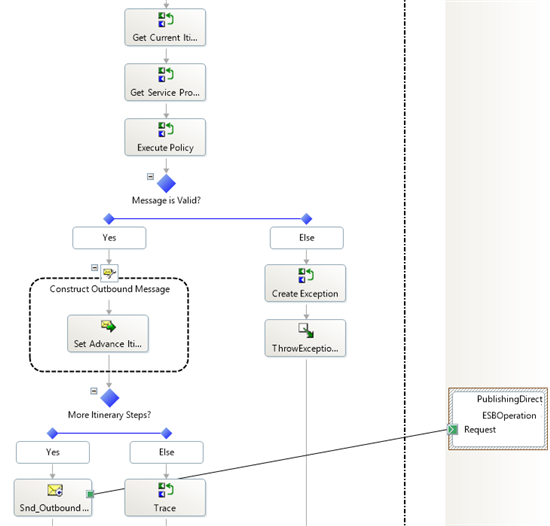 Create an Itinerary that uses the Business Rule Policy Orchestration Extender and the Validation Service to validate the message. Create an Itinerary in the Itinerary Designer. In the Toolbox, click an Itinerary Service model element, and then drag it to the design surface. In the Properties window of the ItineraryService model element, set the Itinerary Service Extender property to Business Rule Policy Orchestration Extender. Figure 13. Itinerary in Visual Studio. In the Itinerary Service Properties set the name of the Business Rule Policy and the Document Type. Figure 14. Itinerary Service properties. When you export the Itinerary the properties are stored in the PropertyBag. Figure 15. XML of an exported Itinerary. Once the Orchestration Service is deployed to BizTalk and the custom component .dll file is placed in the GAC, the Itinerary is ready to be tested. Run the Itinerary Test Client to send a message with the itinerary to the ESB.ItineraryServices On-Ramp. Figure 16. Itinerary Test Client. Figure 17. Trace output in DebugView. If the validation of the BizTalk message fails a Fault message is stored in the Fault table in the EsbExceptionDb database. Figure 18. Fault table in the EsbExceptionDb database.